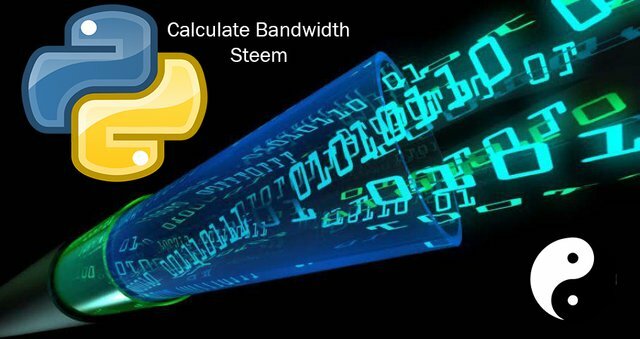 I recently joined Steem and ever since then the limiting factor of me interacting with the community and curating posts was not the voting power but the bandwidth limitation. While you could just check steemd, you could also write a short script and bypass the (currently) extremely long loading times. How does bandwidth allocation work exactly? Well, inside the dynamic global properties we find max_virtual_bandwidth, which is shared across all users and is divided according to their vesting shares (vesting shares translate to Steem Power). Note that because max_virtual_bandwidth is originally multiplied by 1000000 we have to divide by 1000000.
account = "ADD YOUR ACCOUNT NAME"
Because the information is delivered inside a string, we have to get rid of " VESTS" to convert it to a float. Now we just have to apply the above-mentioned formula and we have our allocated bandwidth. As you can see I used round() to round the number to the nearest integer. You don't have to do it but it looks better this way IMO. Please note that this will break the script if you have less then 0.5 steem power. If that's the case I want to remind that this can break your steam account. A bandwidth allowance of zero means you can't do anything! Next step is to calculate the used bandwidth. Since average_bandwidth is only updated if you commit something into the blockchain, we have to calculate our used bandwidth as well. To do this we need to get the current UTC time as well as last_bandwidth_update. last_bandwidth_update has to be parsed into the DateTime format, so we can get how much time passed since the last bandwidth update. An important piece of information is also that it takes 1 week for the bandwidth to go from 0 to 100.
total_seconds is the length of a week in seconds. In the third line, we parse the string with the last bandwidth update into the DateTime format for easy calculations. In line five, we convert the time into seconds. Special thanks to @jfollas for his amazing article that explains how bandwidth works. The contribution was reviewed again as per your request and I feel you have a point . Hey @bloodviolet I am @utopian-io. I have just upvoted you! Your contribution cannot be approved because it is not as informative as other contributions. See the Utopian Rules. Contributions need to be informative and descriptive in order to help readers and developers understand them. End-user focused tutorials must address a minimum of three substantial concepts that are unique to the Open Source project and essential learning requirements for end-users. Preference is given to tutorials that are part of a curriculum (series) of tutorials all of which are sequential and built on previously learned skills and knowledge. With the current influx of new users and this being a common question I would ask to check it again. As for the 3 things somebody learns during this tutorial, I think the tutorial teaches at least 3 concepts of how the Steemit Blockchain works.